Ben Stryker (Henriksen) is a former soldier who rolls in on his motorcycle into the dusty ol’ Western town of Agua Dulce. He’s a man of few words, and lets his short spiky blonde hair do the talking. Or, failing that, he’s pretty handy in a fight. He goes to see his wheelchair-bound buddy Tick (Kennedy), and his son (?) Danny, and reconnects with his old girlfriend Katie (Udy). But breaking up all the fond camaraderie is the notorious Savages biker gang. They come to the quiet town and start raising all sorts of hell. Led by Pigiron (Forsythe) and Zero (Jones), their growing presence in the town is pushing the residents to the breaking point. Even the local bar-mistress, Rachel (Black) has taken up with Pigiron, and no one, from the Sheriff (Gordon) to Rev. Romano (Lynch) can do anything about it. That’s when Stryker is pushed to do what he does best: Stryke. Will he drive the Savages out of town forever? 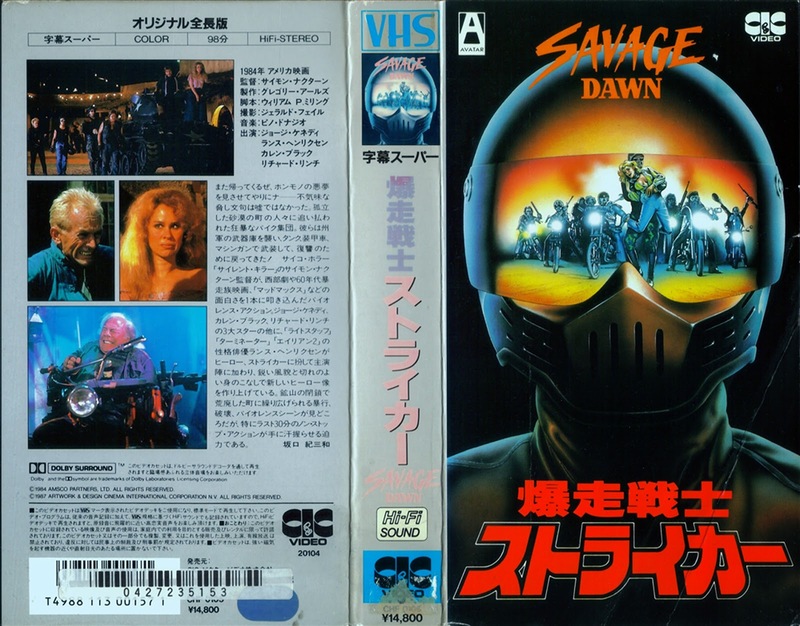 The first thing you’ll notice about Savage Dawn is the amazing cast. 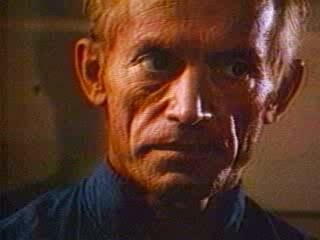 Lance Henriksen is very good as the sly Stryker (who’s also a byker) - another in a long line of men named Stryker or Striker that we’ve seen over the years. He makes a nice addition to the Stryker family. And because he co-stars with William Forsythe and the movie is about bikers, this can be considered as a sort of precursor to Stone Cold (1991). But here they’re at odds, in Stone Cold they’re buddies. But this is like a dry run for that, and in our opinion Stone Cold is the better movie. Karen Black was in Hostage (1987) with Wings Hauser, who was...Striker. Coincidence? George Kennedy put in a sympathetic performance as Tick, and fan favorite Richard Lynch is on board as the creepy reverend. Claudia Udy of Nightforce (1987) and To the Death (1993) gets into a catfight with Karen Black, and Mickey Jones plays Zero, as opposed to Wash Pot. We think he only plays dudes with nicknames. Lockdown (1990)’s Elizabeth Kaitan has a small role, as does, supposedly, Sam Kinison (?) and with all this star-power, you can’t go wrong...right? The movie is too long and too slowly paced, which might be more tolerable if it didn’t primarily take place in one location. It seems the majority of the film takes place in basically a backyard. The choppy editing doesn’t really help matters, and, to add insult to injury, Claudia Udy has a very unflattering hairstyle. All this movie would have needed is a snappier running time, and more Stryker mowing down baddies. Then we’d really have something. But the movie is bloated and sabotages itself at almost every turn. But at one point there is a fruit-cart fistfight, as opposed to a fruit cart car chase, so that’s something different. And stunt genius John Stewart of Action USA fame is here as “Blood” and behind the scenes as stunt coordinator. Plus the score is by Pino Donaggio, but somehow all these elements never work together to make a forceful statement. As for the Image DVD, it’s an obvious “needle-drop” job (for those that don’t know, at least in the world of CD’s, fans use that term to mean when companies don’t go back to the master tapes, don’t remaster anything, or do anything technical to improve matters, they literally just “drop the needle” on the original vinyl and then release that as a “finished” product - too often that is done in the world of DVD as well) - it’s basically a rip of the VHS, complete with tracking lines. Luckily, we don’t care, we’re die-hard VHS watchers, but others out there might take issue with that. It’s also highly unusual for a company like Image to release something like that. What happened? 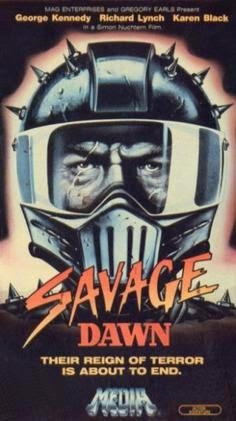 In the end, despite some worthwhile moments, Savage Dawn is a disappointing missed opportunity. Thought this one was pretty entertaining, love just about anything with Henriksen in it. Henriksen was good, but the movie was weak.